In Writing we are applying our sounding skills to write stories and words. The aspects of grammar that we focus on are; spaces between words, capital letters, full stops and rereading to check that our writing is making sense. The children are expected to write at least two sentences independently by the end of Kindergarten. We are continuing to learn to read and write our ‘Butterfly words’ and other high frequency words in our ‘Words to Learn’ book. Our aim is to be able to spell 40 words correctly every time we use them. In small groups we are continuing guided reading and, with support, applying our skills of sounding, predicting and word knowledge to read books. Home reading is progressing for many children very nicely. It is an important way to practise the skills we are learning at school. Be sure to write in your child’s reading log, so that we know books have been read and can reward your child. If you have misplaced the reading log see your teacher for another one. Children are encouraged to use the PM ecollection books as part of the home reading program. Jolly Phonics books and old word books can now be kept at home. Please keep revising sounds so that they can be recalled and written automatically. This term Kindergarten students will commence a homework log book. The program focuses on revision of the sounds and sight words that have been taught in class and allows flexibility for families by giving them the choice of activities throughout the week. 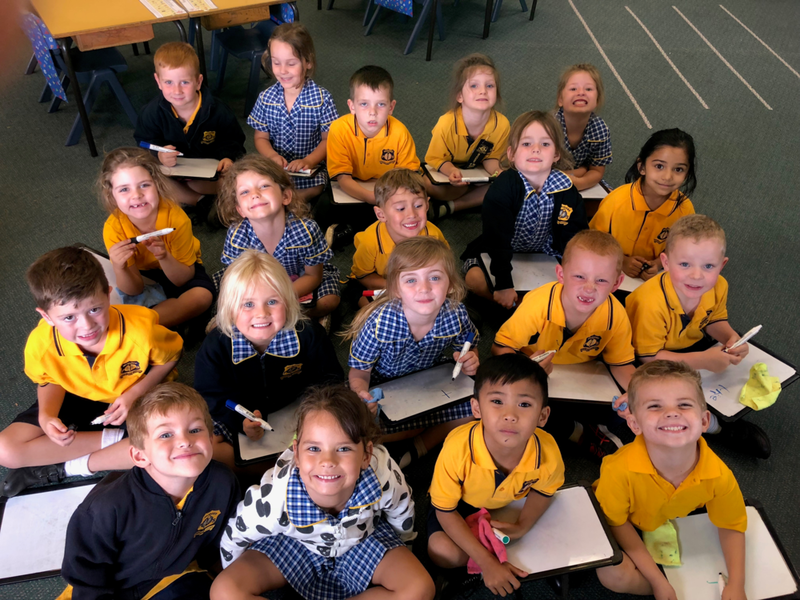 This term Kindergarten are completing an English unit called ‘Stories as a shared experience’ which focuses on the questions: How do we share stories? What makes a good story? Why stories are important? How do stories connect to my own experiences? Duration of time - morning, noon, afternoon, night, digital and analogue o’clock. This term Kindergarten will be studying the unit ‘What’s it made of?’ In this unit students explore their school environment and observe what materials they can find. Students will look at the properties of different materials and which materials are sustainable for the future. This term we will be learning about ‘Personal and Family Histories’. This term Kindergarten will be communicating stories of their own family heritage and the heritage of others. They will identify similarities and differences between families and recognise how important family events are shared. The students will be investigating how they have learnt about their history, what stories other people tell about the past and how these stories can be told and shared. During the unit, students will be identifying people in their own family and how they are related to each other. We will be looking at photographs, artefacts and listening to oral histories. The students will compare and contrast various family groups and identify differences between past and present. We will also be sharing how our family and friends commemorate past events that are important to them. On Friday 7th September Kindergarten will be visiting Dubbo Zoo. We will be leaving school at 7am and return by the bell. Permission notes have been sent home. Please see your child’s teacher if you need another. The cost of $40 includes zoo entry and transportation (bus).